The website will match and put in touch with one another those members researching the same families, et voilà - cousins! We have been contacted many times by people seeking long lost French cousins. 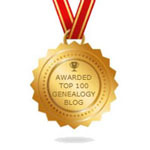 It is unlikely that Lost Cousins will put you in contact with cousins in France, but it may put you in touch with others researching a French ancestor who appears in one of the above censuses. This, in turn, could lead to sharing information with said cousins, to the breaking down of brick walls and - at last - to a French cousin or two. Have any of you, Dear Reader, tried this? Have you found cousins? Have you found French cousins? We are curious to know.